"During the late 1800's Wakefield residents were able to get their news from a wide variety of newspapers. Prior to the founding of the Wakefield Daily Item on May 7, 1894 by Fred W. Young, Wakefield residents read the South Reading Department of the Middlesex Journal (1854), Wakefield Banner (1868) later known as the Wakefield Citizen (1872), the Wakefield Advocate (1872), the Wakefield Citizen and Banner (1874), the Bulletin (1881), and the Record (1886). After the establishment of the Wakefield Daily Item, the Citizen and Banner launched two more newspapers, The Wakefield Evening News in September, 1894, which remained in operation for one month, and the Wakefield Daily Banner in 1899. In March, 1900, Mr. Young sold the Wakefield Daily Item to Alstead W. Brownell, a printer in the Wakefield Block (now the Taylor Building). 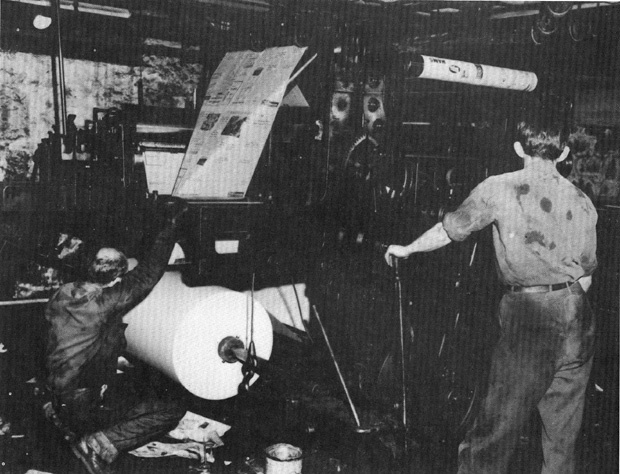 A few days later, in April, Mr. Brownell sold the newspaper and the printing business to Citizen and Banner reporter Harris M. Dolbeare who started his career in 1888 while still in high school. Shortly after acquiring the Wakefield Daily Item and Item Press, he also purchased the Daily Banner in 1900 and Wakefield Citizen and banner (a weekly publication) in June, 1911. One year later, in 1912, the Wakefield Daily Item and Item Press moved from the Taylor Building to its new home at the corner of Albion and Foster Street, making it one of the first small-town daily newspapers in New England to build its own newspaper plant. An addition was built in 1935 on the site of the former Atherton grocery/Champagne furniture store. The Wakefield Daily Item and Item Press were incorporated under Massachusetts laws under the name of Wakefield Item Company on January 1, 1923." -- Text from calendar by Jayne M. D'Onofrio. “Wakefield Daily Item, circa 1950,” NOBLE Digital Heritage, accessed April 22, 2019, https://digitalheritage.noblenet.org/noble/items/show/7123.